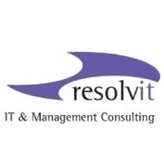 Join Resolvit as a Software Engineer and be part of a creative, forward-thinking team. Our success at deploying skilled, highly knowledgeable experts has landed us on the Inc. 5000 list of America’s fastest-growing companies four times – and we’re just getting started. There are many great reasons to join our team. Because we work with some of the nation’s premier companies, you’ll have ample opportunity to advance in your career. In addition to competitive benefits and compensation, we offer support for ongoing training to help you expand and update your skills. And, our career support team works closely with you to understand your professional and personal goals. This positions you for success by ensuring you take on an appropriate role on a team that’s the right fit for you. Resolvit is an Equal Opportunity Employer and fully compliant with the Family and Medical Leave Act. Want to get notified about new jobs at Resolvit, LLC?